Katsuhiro Otomo once had a reputation as a genius anime auteur — a younger, hipper version of Hayao Miyazaki. His 1988 SF hit “Akira” was unlike anything coming out of the Hollywood animation industry in its dark vision of an atomic-blasted Neo-Tokyo, with its multilayered story of lawless young bikers caught up in an evil government project. Released widely abroad, “Akira” jump-started the worldwide anime boom. Instead of capitalizing on this success, Miyazaki-style, with a string of crowd-pleasing movies, Otomo has spent the past two decades on an erratic career journey, making the little-seen live-action comedy “World Apartment Horror” (1991) and directing a segment of the anime omnibus “Memories” (1995), while working in various capacities on other projects, including animation supervisor on Satoshi Kon’s “Perfect Blue” (1998) and Hirotsugu Kawasaki’s “Spriggan” (1998). His much-heralded return to feature animation directing, the retro-future fantasy “Steamboy” (2004) was a commercial and critical disappointment. 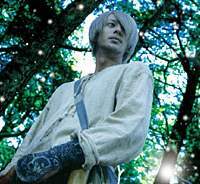 Now Otomo is back with his first live-action film in 15 years, “Mushishi (Bugmaster),” which premiered at the 2006 Venice Film Festival. Based on a manga by Yuki Urushibara, “Mushishi” is also Otomo’s first full-length venture into period drama. Though set 100 years ago, it has a look and feel reminiscent of Miyazaki’s “Mo-nonoke Hime (Princess Mononoke)” (1998) — that hymn to Japan’s ancient natural wonders and mysteries. A comparison of the two films illustrates why Miyazaki is the undisputed king of the Japanese box office while Otomo is not even a contender. For all the knotty complexity of its mythology and plotting, “Mononoke Hime” thrills with dramatically staged chases and battles, moves with its story of starred-crossed young love, in a setting of great natural beauty. “Mushishi,” on the other hand, offers only the last of the above: unspoiled places from around Japan, photographed gorgeously, if not imaginatively, by Takahide Shibanushi. The episodic story, while moving between the title hero’s wandering present and troubled childhood, does not build to any pulse-quickening climaxes. Also, the CGI effects, while eerily evocative, mostly aim to inspire a nature documentary sort of awe, not chills. Finally, the soundtrack, which features the Australian didgeridoo, wouldn’t be out of place in a reflexology salon. Sounds a bit soporific, doesn’t it? Perhaps not for fans of Urushibara’s manga, who have already bought into the “Mushishi” world — though some have criticized Otomo’s highly selective presentation of it. For this nonfan, however, it was somewhat like attending a lecture on the (entirely fictitious) healing properties of lighting bugs, without having done the required reading. I was scrambling to understand, while not entirely connecting. 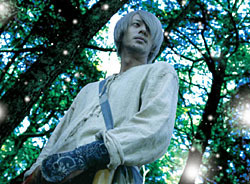 The “Mushishi” of the title is Ginko (Joe Odagiri), a chap with long silver hair and a mysterious air who has the rare ability to see mushi (bugs) — filmy, wormy-looking critters described in the film as the “phantom soul of nature breathing inside every living thing” and having the power to harm humans. He uses this power to heal — his first patients being three residents of a remote mountain village who can hear in only one ear — the other being blocked by mushi. Ginko draws them out by pouring in medicine he carries about in a wooden box, pleasing not only the victims, but the proprietress (Lily) of the inn where he is staying. She brings him a tougher case — a granddaughter who is not only deaf to normal sounds, but hears strange noises in her head, and has grown horns. His cure of her is more complex (he needs to delve into her family history to get at the cause) but successful, as well as visually spectacular. Where does he go from here? Together they go to the house of the beautiful but ill Tanyu (Yu Aoi), infested by an even more intractable mushi called Tokoyami. Tanyu’s formidable former nanny (Reisen Lee), once a mushishi herself, tells Ginko a story about a silver-haired female mushishi (Makiko Esumi) that offers him a clue to not only Tanyu’s case, but his own past. This time, however, the treatment turns out to be harder on the doctor than the patient. Odagiri is perfectly cast as the mysteriso Ginko — low key, but somehow charismatic, as though he really could heal with those bottles of colored water in his box. Yu Aoi also impresses as the otherworldly Tanyu, especially when she “writes” to rid herself of the mushi — the characters flowing directly from her fingers to the paper in one of the film’s most visually striking scenes. “Mushishi,” however, is a text too tangled and murky for the uninitiated to easily penetrate or parse, somewhat like the mushi themselves. But I’ve bought volume one of the manga. Maybe the mushi (if not Otomo) have found one more fan, or victim.